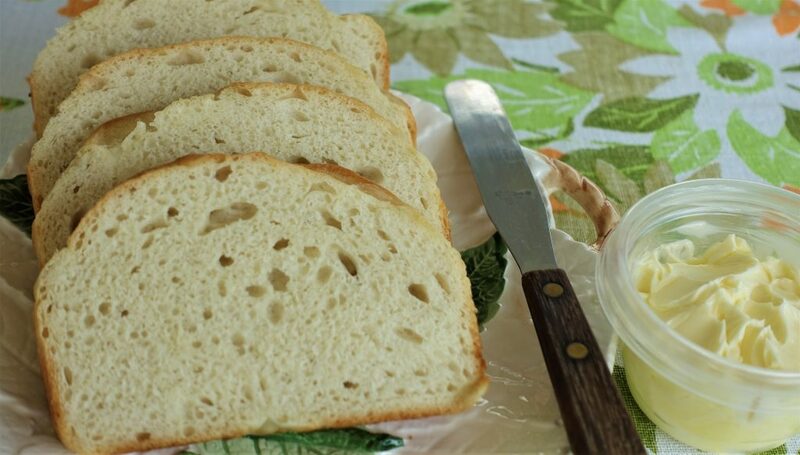 I always thought that the “ No Knead” bread recipe was simple, and it is, but when I found this one for ONE HOUR bread, I could not believe it, until I made it and found it absolutely effortless and delicious. I am sharing my experience with you today, since I know you will love it. In a small bowl pour 1/2 cup of warm water mixed with 1 1/2 Tbs. of honey. Sprinkle the dry yeast over it and mix gently to dissolve. Keep it in a warm place for about 10 minutes, to proof the yeast. It will develop a spongy foam over the liquid. In a large mixing bowl, mix the flour with salt. Set aside. Grease a baguette pan with Crisco or butter, or you may use two loaf pans, or a 9 x 13 pan. Add the remaining 1 cup of warm water into the yeast mixture, then add the wet ingredients to the dry ingredients, and using a dough hook, mix at medium speed for 20 minutes. Remove dough from the mixing bowl, add 1/2 tsp. of oil, to grease the bowl. Please the dough ball back in the bowl, turn it once, to grease all sides of the dough. Remove the dough onto a lightly floured work surface, and knead it few times to form a log. Cut the log in half, and form two long loaves to fit your pan. Place each log in a pan, cover with double thickness of a kitchen towel, and let it rise in a warm place for 20 minutes. During the last 10 minutes of rising, preheat the over to 375 degrees F .
Baste the tops of loaves with milk or cream. Remove from the oven and place the pan on a cooling rack for 10 minutes, then remove the bread form the pan, and complete cooling on the rack. 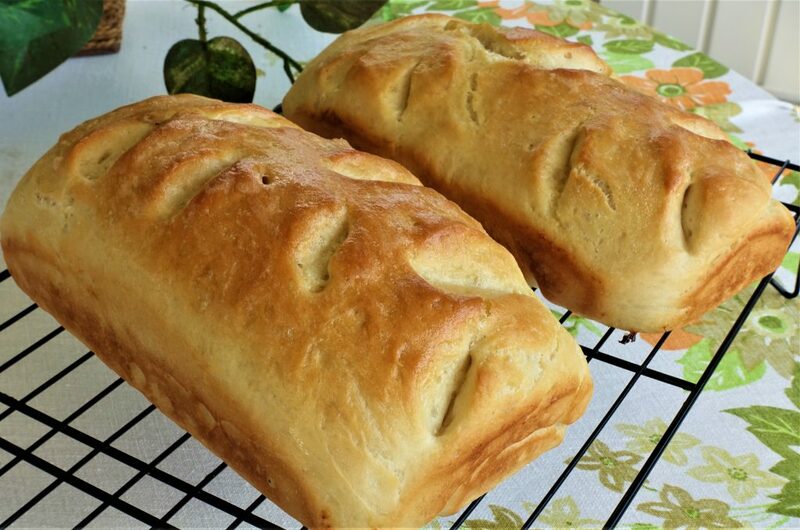 For a soft crust, baste the top of each loaf with butter, as soon as it comes out of the oven. Also, I used kitchen scissors to cut slits in the dough, after placing it in the greased pan to rise.